A wraith gets a hold of the Challenger shuttle Relic and retrofits it to run on Pathos (maybe soulfire crystals or something as well). The wraith launches it and goes to space. I'm a professor! Why is no one listening to me?! I like hypothetical stuff and it's a damn good question. Or, what would happen if a Wraith climbed aboard a skinland craft in the shadowlands? I have a feeling the pull on his Fetters would be too much and he'd find himself unceremoniously yanked out before the ship got outside of the atmosphere. As for the original question I have no idea. I'll have to come up with something. I always liked this question, and I've seen it asked a few times on the forums, but it never seems to go anywhere. I think it has a lot of potential. The Technocrazy has experienced haunted space colonies/stations before, I remember it occasionally being brought up. Space is well alien to human ghosts so I think it would have a lot of cool mysteries. Maybe since its absent of wraiths any wraiths who find themselves there perhaps finds aliens spirits, like maybe its closer to the Umbra, or aspects of the Abyss/Oblivion. Well, I read in the book of worlds the other day that entropy serves as a sort of force of gravity for wraiths, pulling them downward toward oblivion. If you take this literally, then that means that the rocket will never truly escape, because entropy is inherent in every system. Except for maybe transcendence. The new VE book was what actually spawned this question, between the mention of Necronauts and the handy little cosmological breakdown page 55. I have a tendency to ignore rules that are inconvenient or puzzling (“More what you’d call…guidelines.”) so I was curious what the forum weigh-in would be. I have a few scenarios, in-game and in-troupe. …and player wants to hitch a ride on a shuttle launch. ST might rule, as Andreas mentioned, that Space Ghost’s Fetters unceremoniously snap him back Earth-side. ….and players takes off into the wild…err...gray (?) yonder. ST might rule that the Underworld doesn’t have an atmosphere so there is no atmosphere to get through. You just keep going up. And up. Kind of like in a video game when your toon clips off the map but can still keep going and going. You just spent all that time to have a really fancy pathos-fueled jet that is awesome for travel and giving Enochian vampires PTSD. ST is a huge fan of Ghost of Mars and loves the idea of a spacefaring version of the Flying Dutchman. 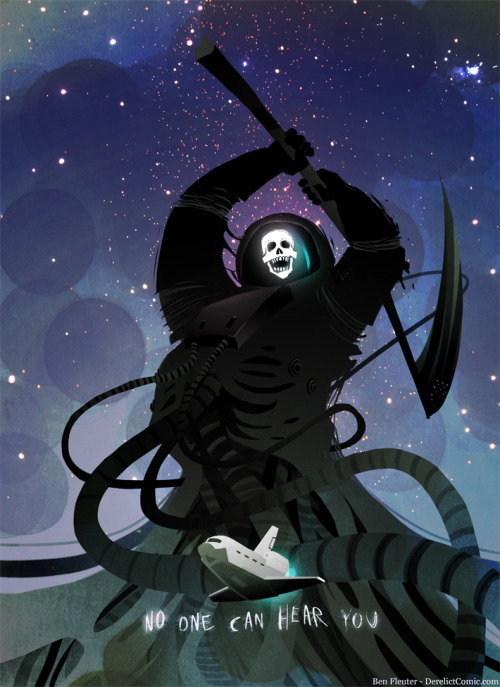 ST might rule, using VE p 55 as a guideline, that Necro-Serenity travels through the Shadowlands of Conventional Space. They can’t interact with the Quicklands while they’re here, but once they get past the (haunted?) asteroid belt, they enter the Deep Universe…along with everyone else. Nephandi, watch out! Stygia’s comen’ for ya’! I suppose all this depends on what kind of themes your troupe wants to mess with. My thinking on this one would be that The Tempest would jack with the sense of direction on the launch. It would look like it's pointed into space, but it's really pointed at a deeper part of The Tempest and straight towards Oblivion. Now, there could be plenty of adventures to be had in a section of The Tempest that seems to be outer space, but further exploration would eventually land in The Labyrinth and the Wraiths would either plasm themselves and run or go check it out. Anyone looney enough to launch the Relic shuttle would probably take the latter option. - If you must be ridiculous, I must ridicule you. How could I know?, how could I know? How could I know?, how could I see? Would it be the whole shuttle or just the orbiter? I think that they would enter the Deep Umbra. I rather like this idea. Wraiths entering the Deep Umbra could have all sorts of gonzo fun adventures. Last edited by Mahjemm01; 09-14-2016, 01:36 AM.